Has Roberto really gone this time? Just as the dust had settled on another unforgettable and emotional season of highs and lows, an official statement went up on the Wigan Athletic website confirming Roberto Martinez has been given permission to talk to another club, believed to be Everton. While most sources have taken the statement — in conjunction with some Dave Whelan quotes elsewhere — to confirm beyond doubt that Martinez will definitely leave Wigan, the carefully worded statement actually suggests that he remains the club’s manager despite opening talks over a move. In terms of what has actually been confirmed by either club, circumstances are pretty similar to those at this time last year, when Martinez carefully considered an offer from Liverpool before using the offer to negotiate greater investment in youth and training facilities back at Wigan. Reports last Friday suggested that discussion during the first meeting between Whelan and Martinez had focused on the Spaniard’s continued demands for investment in said facilities — and probably in a larger squad to cope with Championship and Europa League football next season — rather than his desire to work elsewhere. Four days, ago, Whelan was confident his manager would stay. It is therefore not unfeasible that Martinez could return from his talks with Everton, or Malaga for that matter, and push Whelan once again to give him the financial support he believes necessary for an immediate return to the Premier League and continued long-term strengthening. The fact that we have not heard a peep from Martinez himself, confirms that he has not yet left the club. Realistically, however, it is hard to ignore how appealing the Everton job must look to Wigan’s former midfield maestro, on various levels. Though a much larger club that the Latics, Everton has been run in the same close-knit manner as Latics, by a chairman-and-manager combo built on trust and loyalty similar to that of Whelan and Martinez at Wigan. He would have more money, better players, some stability, and the attractive challenge of taking Everton to the next level following Dave Moyes’ departure. He could do a fantastic job there — particularly given the defensive strength that already exists there. Then there are Dave Whelan’s comments, confirming that his manager has asked to leave, and most recently claiming he is tailor-made for Everton — a dramatic u-turn from his recent statements about Goodison not being a big enough club for him. They all seemingly point to a vacancy at the DW, but we’ve learned over the years how shrewd a businessman Whelan can be. It cannot be discounted that he is playing the media as he has been known to do. 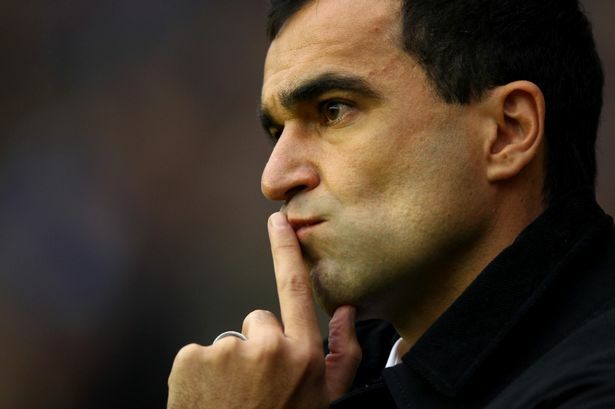 Martinez may, after all, not get the Everton job. If he then were to come back to Wigan, Whelan would be able to welcome him back without giving in to all the demands Martinez made of him. Early rumours for the potential Wigan vacancy include Brighton manager Gus Poyet, who is also apparently a candidate at both Everton and Stoke, and Manchester United coach Rene Meulensteen. Both fit the continental, good-football mould, though the former has had issues with his chairman at Brighton over transfer funds, while the latter has very little managerial experience despite top pedigree as a coach. Plenty of other names have been and will be mentioned, but the issue is probably best left untouched for now — as Martinez has not yet, per the club, resigned. ← What happened to Latics this season? An analysis.